Way-too-early 2020 top 25: Virginia’s the team to beat, but what about Washington and Gonzaga? Jon Wilner's Pac-12 Hotline is brought to The Seattle Times through a partnership with the Bay Area News Group. Wilner has been covering college athletics for decades and is a voter in the basketball and football AP polls, as well as the Heisman trophy. He shares his expert analysis and opinions on the conference for the Pac-12 Hotline. What we saw Monday night — Virginia raising the trophy — we could see again a year from now. As of this moment, the Cavaliers are the team to beat in 2020. The following rankings will be updated in late May, after the deadline to withdraw from the NBA draft. Also considered (in no particular order): Mississippi State, Louisville, Arizona, Purdue, Syracuse, UC Irvine, Baylor, Memphis, Davidson, Colorado, Wisconsin, Kansas State, Virginia Tech, Florida, Arizona State, Buffalo and Iowa State. The Pac-12 is seeking a $750 million investment. It’s bold, but is it smart? 25. Ohio State: With the Wesson brothers returning, OSU should look more like it did in Chris Holtmann’s first year than his second. 24. Seton Hall: Guard Myles Powell (23 points per game) leads a stout returning core for the Pirates, who should challenge for the Big East title. 23. Texas Tech: Jarrett Culver has played his way into the Lottery, so we’ll assume he’s leaving. Two other important pieces of Red Raiders’ roster are moving on, as well: Tariq Owens and Matt Mooney. The rebuild begins for coach Chris Beard, whose track record suggest the process will be swift. 22. Washington: Sure, the Huskies were hammered by the expiration of eligibility clocks, but there is hope: If Jaylen Nowell returns — and his NBA projections aren’t ideal — then the Huskies just might maintain their momentum. Nowell and 5-star big man Isaiah Stewart would be a dynamite duo. 21. Utah State: Sam Merrill leads an experienced group for second-year coach Craig Smith, who worked wonders in his first season in Logan. The Aggies might be even better in ’20 than they were this season. 20. Florida State: The Seminoles had two double-digit scorers, and one of them, Terance Mann, was a senior. Mfiondu Kabengele will need help, and lots of it, in order for FSU to avoid a major backslide. 19. VCU: The Rams won 25 games and the A-10 and should be markedly better next season with four double-digit scorers returning. 17. Cincinnati: The top-three scorers are expected back, led by Jarron Cumberland (one of the top players in the AAC). And it looks like coach Mick Cronin will join them. 16. LSU: Naz Reid and Tremont Waters are gone — they hired agents — and coach Will Wade probably is, too. (He hired an attorney.) But guard Javonte Smart is expected to return, ensuring the Tigers remain a contender in the rugged SEC. 15. Iowa: The top-four scorers are due back for the Hawkeyes, who should gain ground in the Big Ten considering their retention rate and the departures elsewhere in the conference. 14. Houston: Top scorer Corey David Jr. departs, but coach Kelvin Sampson has plenty of experience to lean on as he counts the dollars in his whopper of a new contract. 13. Villanova: Phil Booth and Eric Paschall are gone, but there’s no chance the Hotline is picking a Jay Wright team outside the top 20, especially one with a loaded recruiting class on the way. 12. Oregon: If everything breaks right, Kenny Wooten, Payton Pritchard and Louis King return and the Ducks are a top-10 team. If they all leave, the Ducks aren’t a top-25 team. We split the difference and await the decisions. 11. North Carolina: Cam Johnson, Luke Maye and Kenny Williams are seniors, while Coby White and Nassir Little have declared for the draft. That doesn’t leave much behind, even for this program. 10. 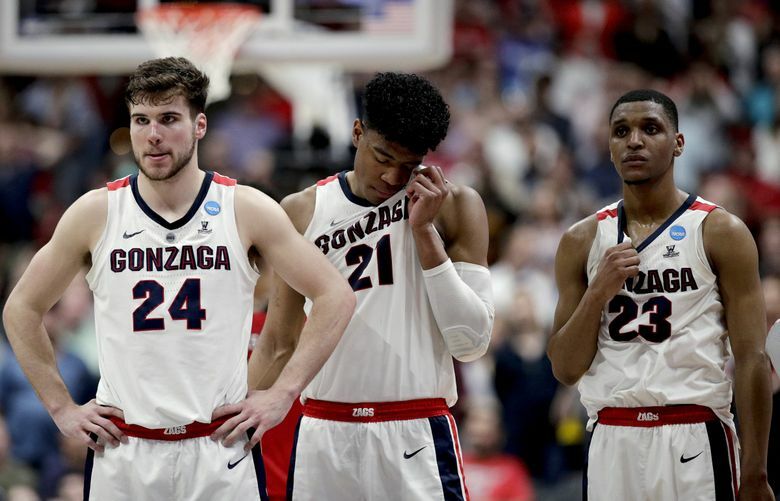 Gonzaga: We know Josh Perkins is leaving, and we can assume Rui Hachimura will enter the draft. If Brandon Clarke returns to join Zach Norvell, Corey Kispert and whichever future stars Mark Few has tucked away, the Bulldogs should be a load, again. 9. Kentucky: The Wildcats used to be the toughest roster to project because of all the one-and-dones, but Duke has joined them in that regard. We’re figuring PJ Washington has played his last game, and Reid Travis has, for sure. What remains, and what’s arriving, should work just fine. 8. Kansas: The forgettable season by KU’s standards should give way to a return to the elite level, although potential FBI/NCAA fallout could force a revision of this forecast. 7. Tennessee: Admiral Schofield departs, and Jordan Bone has declared for the draft, but it’s entirely possible that the rest of the double-digit scorers will return, including the Vols’ engine, Grant Williams. 6. Marquette: As of now, Marquette projects to return its top-six scorers from a team that won 24 games. If the masterful Markus Howard (25 ppg) heads to the NBA, we’ll revise. 5. Auburn: We’re not ready to project the Tigers as a Final Four team, but with four of the top-five scorers due back — only Bryce Brown departs — they should be playing the second weekend of the tournament, at least. 4. Duke: All the guys who got zero attention, which is everyone not named Zion Williamson or RJ Barrett, are due back for the Blue Devils, who add the No. 3-rated player in the country in Vernon Carey. Won’t be as good as they were but should still better than 340-something teams. 3. Michigan: Charles Matthews was an important piece of the Wolverines’ success. He was also their only senior. (Ignas Brazdeikis can’t possible turn pro, can he?) Make way for another run at the Big Ten title and the Final Four. #basketballschool. 2. Michigan State: It all depends on Cassius Winston. If he turns pro, the Spartans will take a step back. If Winston returns, MSU could well be the preseason No. 1. Tom Izzo’s group is a year ahead of schedule. 1. Virginia: Expect De’Andre Hunter to depart, but Kyle Guy, Ty Jerome, Mamadi Diakite, Kihei Clark, Braxton Key — they’re all scheduled to return. The top of the ACC is like no place else.